From private heartaches to public battles, "the quintessential American rock band" has had a career full of high drama. So why are they now on top of the world? It’s three o’clock on the kind of perfect spring day winter-hardened Chicagoans pray for as Jeff Tweedy’s black minivan stops in front of a drab, stocky building, tailor-made to instill institutional heebie-jeebies. This used to be a Catholic school, but now it’s a Montessori, all full of warmth and encouragement on the inside. Kids’ art beams from the walls, engaged parents confer with passionate educators, bright-eyed tykes zigzag toward the idyllic afternoon waiting beyond the front doors. Tweedy, frontman of alterna-rockers Wilco, is every bit the alterna-parent — he’s wearing a gray button-down with the sleeves rolled up past his elbows, dark jeans, and newish, blueish tennies. A Milwaukee Brewers hat he got for throwing out the first pitch at an April game fails to cover protruding tassels of gray-tinged dark brown hair. Tweedy pokes his head into a couple of rooms before he locates his mop-topped progeny — Sam, nine, and Spencer, 13 — entering from the playground amid a swirl of classmates. Sam is carrying a Young Bond novel and a computer illustration he made in typing class that might be described as Inca-futurist. He seems deeply unimpressed that music magazines dispatch journalists to follow Dad around with a tape recorder. Spencer is only slightly more engaged by the idea. Music has always had a public component in his life. He is in Sam Jones’ 2002 Wilco documentary, I Am Trying to Break Your Heart, a gifted and talented six-year-old prodigiously punishing a drum set. The pop-punk band he plays in, the Blisters, performed at Lollapalooza 2007, and he celebrated a recent milestone sitting in with his dad’s band at Madison Square Garden in New York, where the crowd sang him a hearty round of “Happy Birthday.” When Wilco released the cover art for their seventh album, Wilco (the album), he blogged about it. “If I could get one magazine, it would be Rhythm,” he says as we pile in the family vehicle. “You just like that magazine because they put Keith Moon on the cover with his tooth missing,” Tweedy counters. The ride to the Tweedys’ home takes about 20 minutes, thanks to grinding rush-hour traffic. In that time a variety of subjects are discussed. “Sure it does,” Spencer insists. And then he starts beatboxing. Tomorrow, the men of Wilco — who include drummer Glenn Kotche, guitarist Nels Cline, bassist John Stirratt, multi-instrumentalist Pat Sansone, and keyboardist Mikael Jorgensen –will fly to Tenerife, the largest of the Canary Islands, before playing a few dates in Spain and Portugal in support of Wilco (the album), their laughiest disc to date. The album’s cover features a camel standing on a sunny roof next to a table with a cake on it set for six, which could easily be read as symbolic of the sweet life the band is now enjoying after wandering a desert of tough times, or it could be symbolic of absolutely nothing. Either way: laughy. Even laughier, the record opens with a winking, clamoring boogie called “Wilco (the song),” in which Tweedy advises, “Tired of being exposed to the cold? / …Put on your headphones before you explode / Wilco will love you, baby.” Wilco’s 15-year career has had its playfully self-aware moments — the big-hair pastoral “Heavy Metal Drummer,” from 2002’s Yankee Hotel Foxtrot, the hipster-nudging “The Late Greats,” from 2004’s A Ghost Is Born — but the band has never really done obstreperously silly and unguardedly optimistic until now. In other words, music equals God, and God is our homey. Since forming in 1995, Wilco have slowly risen to become the greatest small-scale success story in American rock, following the sounds they like wherever they go while deepening and expanding their audience. The record industry collapses but they thrive, beating the Death of the Album by becoming such a successful touring band that album sales (which usually hover around a few hundred thousand per) aren’t make-or-break. They play Anchorage, they play Tulsa, they play multiple shows in Montana. They build it, people come. 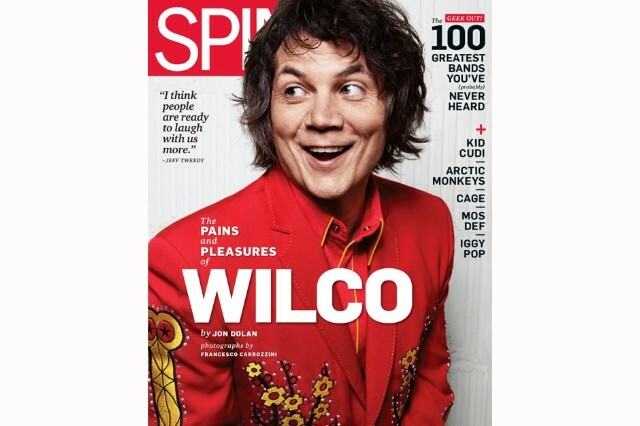 Read the entire Wilco cover story in the August 2009 issue of SPIN, on newsstands now.